As I have mentioned before, Paul bought our present home and property with the future generations in mind. At the time we had three teenagers, so grandchildren seemed an idea for the far and distant future. Here we are fourteen years later with an eight-year-old, and four grandchildren, a gift from Colin and Jennifer. The children ran their little legs off on Saturday as we celebrated Qavah's birthday. Her party included Grandma and Granddaddy, and all of her "forever family." At the end of the day Qavah crawled into bed and said, "You know what? This was the best best day ever!" I'm glad she thought so. The tree house has an automatic gate closer at the top. Once the children enter into the tree house, the gate closes behind them for safety. Paul also rigged up a little basket and pulley to hoist up toys and snacks. The children had a picnic supper in the tree house and we could hear them talking from below. They were dreaming about finding pirates with their spy glass that Paul made for them out of PVC pipe. I couldn't have imagined all of this back when we bought this home, but I am glad Paul did. Sometimes God gives us dreams a size too big so that we can grow into them. This dream now fits perfectly. Click on the picture below and a little picture album will appear. To see a clearer picture, click on the pictures within the album. We are working on the clarity of the pictures and we'll fix them later tonight. 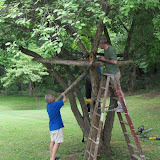 Paul said that there is not one square corner on the tree house and everything had to be custom fit. It took almost four weeks to complete, working at it a little bit each evening. My husband told me that sometime soon, on a moonlit night, there will be two chairs up there with two cups of coffee for us. Nice!